wheremmsgather: The Rooster is a-Crowin'!! "What is that dad-blastit durn noise?” I asked my husband in the wee hours of the mornin’ this fine Tuesday. “Well, dear, you do live in the country. Perhaps one of the farmers around here now has a rooster.” The love of my life replied. “Oh, brudder!” I moaned slowly rolling my sleep-deprived body out of bed. I decided to just get up and get ready early for work. As is my usual routine, I stumbled to the bathroom and when I turned on my radio, the disc jockey was cockadoodle-doodling! I thought that was really weird, but you know how disc jockeys will do anything to boost their ratings. Stumbling to my stamping room, I turned on my computer to get my morning fix of stamping news. “Cockadoodle-dooooooooo!” screeched from my computer as it roared to life. “What the…?? ?” I exclaimed. You see, my computer has never cockadoodle-dooooed before! My foggy mind still wasn't making any connection when I went to the links in My Favorites. “Cockadoodle-doooooooo!” screeched yet again from my computer as the infamous This Is My Story glob came into view. I just had to chuckle when I saw da Muddermark’s inspiration teapot today: it was a chicken!! Oh, brudder! By this time, I was finally fully awake and it dawned on me that somehow, some way, da Muddermark had stopped by for a visit. She has amazing powers and this was her way of reminding Bertie (my alter ego) that it was Tuesday and she wanted me to get up and play in her TEAPOT TUESDAY challenge! I stamped one of my favorite chicken stamps from Stampin' Up's Best of Cluck set with Tuxedo Memento Black ink so I could color him with my Copic markers. The layout is a design from the Card Positioning Systems website, sketch #118. As you can see, my chicken also has the pox, so he'll be safe in attending the tea party in the coop this week. You wanna play, too? Go check out the details on Cindy's glob! Bertie's bringing m & m chocolate covered chicken eggs! I also have to show you this adorable teapot pin that MariLynn sent me. MariLynn has been a faithful Mothermark Teapot Tuesday challenge participant, and I am honored and delighted that she made this for me! Isn’t it cute?? Thank you, MariLynn! You are so very thoughtful and sweet! Have a wonder.....er, I mean, COCKADOODLE-DOO splendiferous day! Well its about time you woke up lazy bones! I been pecking and cockadoodling at this stinkin' puter screen all monin! Good thing you heard me as I am up to my eyeballs in chicken poxed chickens and need some help at the tea party. It seems that the word is out and all the poxed out chickens are flockin' to the teaparty! Please don't bring black and white M & M chocolate covered eggs, instead bring different colors, I worry about getting them mixed up with the chicken pox spots and not being able to eat em! What a cute card Marilynn sent you! She is such a kind person!!! Oh yeah, and splendiferous is not a word, goofball! hahahaha...bawwwk...too funny! so glad we don't have chickens anymore! just the blasted robins that think they have to start singing soooo early! thanks for ID'ing the butterfly (obviously I was too lazy to do so!) and, no...not yet... Thurs MAYbe! Brilliant! So fun, fresh and such a fabulous design and colors. Wowzers, Charlene, this rocks! I think we should have a story-a-thon between Bertie and Gertie....I think you are pretty evenly matched....showed be a good time for all...maybe could combine it with a tea parts so Gertie could use all those teapots and Bertie could wear her new teapot pin. Whatayasay??? Ready for a rumble?????? Cockadoodledoodlesquawk...cockapoo poodle...teapottacockadoodlegirl...R U redee 4 a rumbledoodledorf???? I did read Cindy's post and boy does she crack me up!!! To funny she is....Always lights up everyone's day. I do disagree on one thing she said though, Splendiferous is a word. It is in the dictionary. I know cause I looked it up since when I saw her post or comment to you, I thought oh no, I just used that in Charlene's post for her CCEE Challenge card in honor of Dawn. LOL! Phew....saved! Love your roster card!! Too cute with all the colors and the sentiment!! 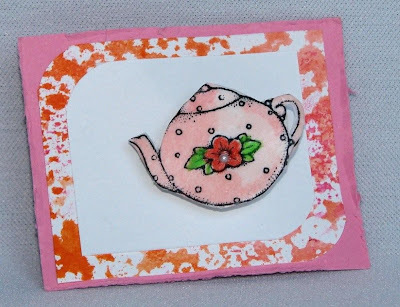 Your teapot card is beautiful!! Oh, and I have one of those cute teapot pins too, it is so sweet of MariLynn!! Love your card .... it was probably your own stamps that woke ya up this morning hehe! I think maybe your were sleepwalking through a dream to your stamp room and this is what you came up with.. This is by far one of my favorite OLD SU sets. 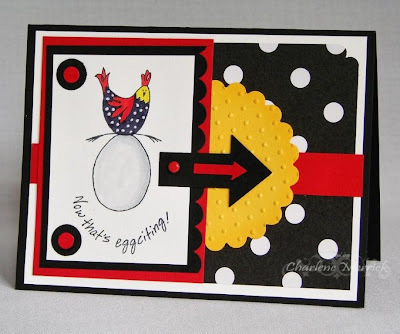 Such a super one to use for today...Great job..now go take a nap..
Love the colors on your Cindy's teapot card - the chicken looks so cute and love your nestie circle Charlene! Hehehe...this is such an adorable card, and such a great story too, Charlene! That little tea pot pin is adorable too!! Both cards are fabulous!! Love the bold bright country colors in the chicken card and the soft delicate look of the teapot one. You are so versatile! I love your story..... you and Cindy have a great chemistry! Beautiful card! You tea partiers (is that a word? )are just awesome! This is toooo funny! I guess I am going to have to join in on the tea parties on Tuesdays! Umm, I want to know how early you get up in the morning to get ready for work and ALSO have time to make a card??!! I don't think I could drag this hunk of body out of bed early enough to get ready for work AND make a card, even if the dern rooster was sitting on my head!! Sheesh that guy is loud!! Scared the bahjeebees outta me!! Fun, fun card though!!! LOVE the arrow...even though I don't know what you're pointing at. My mom always taught me it was rude to point.